One of the many questions we often get on our Facebook page is about tahini. Many people aren’t aware that most tahini contains gluten, the countries the tahini in the UAE comes from generally wont list the gluten it contains. So even though the jar may say 100% sesame seeds, there is still gluten inside. 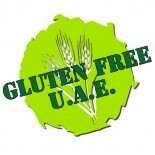 This obviously also means that most hummus you get in the UAE also contains gluten, in restaurants, shops jars etc. If you ask in a restaurant if their hummus contains gluten they will usually tell you no, because they aren’t adding gluten, and their tahini says 100% sesame seeds…. Safest thing to do (only thing to do) is to make your own hummus using a gluten free tahini. As a general rule any tahini you buy should say GLUTEN FREE on the jar. The 2 below are safe. Remember, a jar saying 100% sesame is no guarantee at all that its safe as the sesame seeds are toasted/roasted with flour! The jar MUST say gluten free, or you need to contact the company to ask them about their methods. To make gluten free hummus, all you need is a mini chopper or a food processor, lemon juice, garlic, a can of chick peas, tahini and extra virgin olive oil. Drain your chick peas and pop them in the mini chopper, then add half a garlic clove – a whole garlic clove (any more and you will have dragon breath for days!) Then add a whallop of tahini, I usually add around 1 teaspoon, but Im not a big fan of to much tahini, you add as much as you like. Then add olive oil and lemon juice, salt and pepper. Are the two examples of tahini available in the uae and if so at which shops? Is the chick peas cans having a hidden gluten???? This entry was posted on 27/02/2014 by glutenfreeuae in Arabic, Products, Recipes and tagged gluten free, glutenfree, hummus, sesame seeds, shopping, tahini, UAE.